13% Off Orders at Goldsmiths Get 13% off when ordering gorgeous jewellery from Goldsmiths! 13% Discount In-Store on Full Price Orders at Goldsmiths Get 13% when you're going in-store to order the perfect jewellery! 10% Student Discount at Goldsmiths Who doesn't love to save a few quid? Now's the time to save a with Goldsmiths! 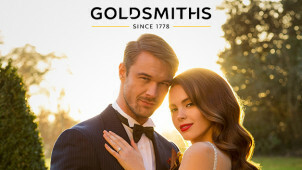 20% Off Wedding Ring Orders at Goldsmiths Here comes the bride... Get the perfect ring for your wedding while saving 20%. 20% Off Build Your Own Engagement Ring Orders at Goldsmiths Make your proposal even more magical with 20% off build your own engagement ring orders at Goldsmiths! Up to 50% Off Selected Diamond Rings at Goldsmiths Shop the selection of diamond rings at Goldsmiths, now with up to 50% off! Free Delivery on Orders at Goldsmiths No matter how much you spend, Goldsmiths will deliver it for free! Gift Cards from £10 at Goldsmiths If you're struggling with what to get the jewellery lover in your life, get a gift card from Goldsmiths and let them choose exactly what they're looking for! Up to 50% Off Selected Watches in the Sale at Goldsmiths Get yourself a real bargain and get up to 50% off selected watches in th sale at Goldsmiths. 20% Off Perfect Match Bridal Set Orders at Goldsmiths Find your perfect forever ring with 20% off at Goldsmiths! Free Click and Collect on Orders at Goldsmiths Don't fancy waiting around for your delivery, pop into your local Goldsmiths store to collect your order, for free at Goldsmiths. Up to 50% Off Bracelets at Goldsmiths Shop the beautiful bracelets, now available with up to 50% off! Up to 30% Off Luxury Watches at Goldsmiths Omega, Tag Huer and more - with up to 30% off at Goldsmiths! Gift Wrapping from £2.50 at Goldsmiths Get your gift delivered already wrapped from £2.50 with Goldsmiths! Up to 30% Off Selected Diamond Jewellery at Goldsmiths Shop the rings, necklaces, earrings and more - now with u to 30% off! Built on tradition and more than 230 years of experience, Goldsmiths is your specialist jewellery dealer for all your treasures. No matter who for, or for what occasion – with Goldsmiths you can create a memorable moment with their brilliant and unique offerings. Goldsmiths brings you the cream of the crop in jewellery designers, showcasing only prestige names and the finest materials. Diamonds and precious metals, big and small – every piece is remarkable with Goldsmiths. If you want diamonds to be your best friend but don’t know your cut from your carat weight, Goldsmiths will take you through the selection process so that you can find the perfect piece to mark a milestone moment. They distinguish between the four Cs: the cut, clarity, colour and carat so that your diamond of choice does nothing less than dazzle you and the special receiver. Get the diamond lowdown on their website on how to choose and care for your jewels. Should you have any queries regarding repairs, then you can visit them instore, use their Store Finder to see where your nearest showroom is in a flash. Go to the Goldsmiths’ page on vouchercloud to select the offer you would like. Click ‘show code’ and then ‘copy code’ before clicking through to Goldsmiths’ webpage. Browse through their collections add select the items to add to your shopping bag. When you have made your decision, click on your basket displayed in the top right-hand corner and select ‘checkout’. Here you can review your order and enter your promo code on the left-hand side. Click ‘apply’ to see your savings then once you have selected a delivery option – you can checkout via PayPal or another secure method of payment. Visit the Goldsmiths’ ‘Pre-Owned’ page to find second-hand watches that are nonetheless brilliant in quality and design. Their beautiful timepieces are in perfect working condition and always with a great cut on the price. Does Goldsmiths offer repairs and servicing? Accidents happen and Goldsmiths recommend that you take your pieces to see a specialist in-store should anything go wrong. See the whereabouts of their jewellery craftsmen on their Servicing and Repairs’ page; use their handy store locator to contact your nearest showroom and make an appointment. What are the Goldsmiths delivery options? Goldsmiths use a trackable delivery service where a signature upon delivery will be required, unless the order value is less than £100. You can request either a standard delivery of 1-3 working days or an express delivery service is also available if items are in stock and ordered before 9pm. For more information, you can visit their Delivery Information page. Can I return Goldsmiths jewellery? You can request to refund an item within 14 days of the despatch date and exchange requests can be made within 30 days. You will need to download and complete the exchange and returns form, please refer to their Returns Policy for more information. Standard Delivery is free - takes 1-3 working days. Express Delivery is also free - order by 9pm. To return items, download an exchange and returns form here and add to your order, complete with original packaging. Returns can be requested within 14 days of the date of dispatch, with exchanges having a 30-day turn around time. In 1778, Goldsmiths opened its doors in Newcastle as the first UK stockist of Rolex watches. Today, the unrivalled high street jeweller is still the biggest seller of Rolex, Omega and Cartier watches. Now you can shop with a Goldsmith's discount code, designer timepieces come with a seductive price tag! Find a personal treasure sure to put a twinkle in their eye, and celebrate them with the perfect investment from Goldsmiths. Water resistant isn’t the same as waterproof! If you’re seeking the expertise of a watch specialist to assist you in purchasing a luxury timepiece, Goldsmiths will help you distinguish your mechanical movements from your quartz. Each watch has a measurement indicating how resistant your particular timepiece is to moisture, so ask your Goldsmiths specialist for advice to take very good care of your watch in-store. For technical, precision wristwear, you simply must consider the selection of Goldsmith's watches. From Breitling’s chronometer-certified movements to the fashionable faces Michael Kors, Goldsmiths has a watch for every wrist. Don't be put off the price tag, and use a Goldsmiths voucher code to save on a very special accessory. As the UK’s largest authorised retailer of designer watches, you’ll find the best from TAG Heuer, Cartier, Longines, Hublot, Bremont, Chanel and many other top luxury brands.